he created for the state’s 20th Annual Technology Exposition. 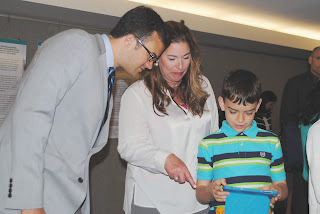 State Senator Art Linares (R-33) met with Colchester elementary school students who showed off their techno-savvy during the state’s 20th Annual Technology Exposition at the state capitol on Wednesday. Students from Jack Jackter Intermediate School demonstrated the video games they designed in a project titled The Story Behind the Video Game. They were required to develop a story, develop a problem to be solved, and then use Bloxel kits to create their games. Sen. Linares said he was impressed with the stories students created for their games and their ability to bring them to life. Sen. Linares said he was happy to see that both boys and girls participated in the project. He hopes to see schools find more ways to get students interested in science, technology, engineering, and mathematics (STEM). Sen. Linares represents the communities of Chester, Clinton, Colchester, Deep River, East Haddam, East Hampton, Essex, Haddam, Lyme, Old Saybrook, Portland, and Westbrook.